Call for papers ! Information processing in Cortical Networks (closed). Brain research progressed tremendously over recent decades, but understanding how cortical networks encode and decode information is still an open issue, and the ultimate question of information processing in our brains eludes us. Being highly multidisciplinary in nature, research into information processing in cortical networks (IPCNs) should combine vast amounts of heterogeneous data and information to provide theories and conclusions. A fruitful synergy has evolved between computational neuroscience and neurobiology; computational models are employed to predict in vivo measurements and to study the functioning of brain structures. 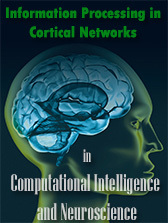 A special issue of the journal "Computational Intelligence and Neuroscience" will bring together the various experimental fields by concentrating on the leitmotif information processing in cortical and cortical-like networks and the understanding of the basic principles of their functioning. The emphasis will be on information processing in networks comprising a few or up to tens of thousands of neurons. We are glad to inform that we have finished long negotiations about the pricing policy of our FSPS™ software. Our original idea was to make it freely available for all neuroscience society and neurophysiology labs. But, we are in the real world where the interests of commercial companies whose algorithms have been partially used in FSPS™ must be considered. However, today we have concluded to make FSPS™ software completely FREE for all Non-Commercial Academic Applications under Creative Commons Public License (CCPL BY-NC-ND), while the Pay License is still need for any commercial use. Since the version 3.0 of FSPS™ software mentioned CCPL has been already integrated into software installation and is available for Download. In the latest version we have introduced some text-based import/export formats and improved HDD streaming functionality. Most important improvement is that we have markedly increase the classification performance (now it remains stable and accurate up to 500 spikes/s with most standard computers). To see some examples please, visit our new page -Video Samples-. FSPS™ has participated in 2012 Nicola Chiari Award for Best Application in Measurement and Automation, promoted by National Instruments Italy (see the link in Italian). Online version of the Case Study is here. c) a decision to act on the incoming information then requires the generation of a different motor instruction set to produce the properly timed muscle activity we recognize as behavior. Neurons receive patterned synaptic input and compute and communicate by transforming these synaptic input patterns into an output sequence of spikes. As spike waveforms emitting by each particular neuron are similar, information encoded in spike trains mainly relies on the interspike intervals. From one side, relying on timing rather than on the details of action-potential waveforms increases the reliability and reproducibility in interneural communication. On the other part, the intrinsic membrane conductances can enable neurons to generate different spike patterns, including high-frequency bursts of different durations which are commonly observed in a variety of motor neural circuits and brain regions. The biophysical mechanisms of spike generation enable individual neurons to encode different stimulus features into distinct spike patterns. Spikes, and bursts of spikes of different durations, code for different stimulus features, which can be quantified without a priori assumptions about those features. Simultaneous recording of activity from many neurons can greatly expand our understanding of how information is coded in neural systems. Multiple electrodes or multi-site electrophysiological recordings have become a standard tool for exploring complex brain functions and behaviour. However, these techniques point out the necessity of fast and reliable unsupervised spike sorting. Our FSPS™ software and algorithms performs highly accurate online spike sorting for any type of the continuous data stream. Besides, it is completely automatic in determining the number of firing cells and their classification thus could be successfully applied for multi-electrodes. Indeed, since the version 2.1 FSPS™ supports multi-sites acquisition and analysis. Most intriguing things (what we're working on now) is the processing of spike occurrences and latencies that could allows FSPS™ application to study of neuronal activity patterns and their dynamical changes under various experimental tasks or clinically recorded data. Since the graphical user interface was built on LabVIEW™ (National Instrument, USA) the FSPS™ spike sorting software has become multi-platform compatible and can be easily adapted for any experimental design. FSPS release ver. 2.1 /build 084/ is available to download now. In this version we have finished the redesign of advanced state-machine interface. In this way the work with FSPS software become more intuitive and affordable. Starting with this release we announce math tools integration into spike sorting results evaluation. Namely, we have implemented Mahalanobis distance measurements to find and eliminate noisy spike shapes in high-dimensional feature space. Added the possibility to merge and reorder different clusters manually (as highly requested by some of our customers). Additional Histogram data export is realized. FSPS release ver. 1.6 /build 164/ is available. Presentation of Fuzzy Spike Sorting Software at BMI Meeting in Italian Institute of Technology (IIT). 3) … and some extra techniques. News - SfN, Neuroscience 2011. SfN's annual meeting provides the world largest forum for neuroscientists to debut research and network with colleagues from around the world. Neuroscience 2011, SfN's 41st annual meeting, is scheduled for Nov. 12-16 in Washington, DC at the Walter E. Washington Convention Center. Through lectures, symposia, workshops, and events, attendees experience innovative neuroscience research. The meeting features thousands of abstracts and provides networking and professional development opportunities. Advantages of our FSPS software. Read more about our innovations, inventions and practical solutions here. We announce new FSPS release, ver. 3.0 /build 004/ from 30.06.2012. Better design of advanced state machine interface, faster analysis, new math functions and additional export features are available. This version performs multi-channel data acquisition. Besides, it is completely FREE for any Non-Commercial Academic Applications under the Creative Commons Public License (CCPL BY-NC-ND). Installation of FSPS spike sorting software and the work with is going to be very intuitive for the scientists familiar with spike sorting issue. However, we recommend this online manual to understand better the functionality of FSPS software and its options. In the this section you can download FSPS software for FREE and try it ! The information about supporting formats, simulated and real data sets with their clustering results can be found here. We are open to any kind of commercial and/or scientific collaboration. In particular, we are ready to discuss implementation of the software into real-time environments, support of tetrodes, multi-electrodes arrays etc. Additional inquiries can be submitted directly to Authors. Our contact information can be found here. References about FSPS method, major details on experimental and clinical applications of the software are here. The author of this project is now seeking for a PostDoc Fellow to continue his interdisciplinary neuroscience research. Please, see his Curriculum Vitae for more details about research experience and interests. Which is the most important feature of the Spike Sorting software in your application ? FSPS software would not be realized, if not strong contribution of many people from mentioned below institutions, who in recognition of the excellence and the goals of our research project have lent their generous support. We remain open to further scientific or commercial collaboration !